Pizza, cinnamon rolls donuts, they’re all mouth-watering, all ridiculously addictive, and all... thanks to yeast! Yeast is a living organism that belongs to the family of Saccharomyces Cerevisiae - but I like to call it “The Sugar-Eating Fungi” (awesome but obscure halloween costume anyone?) This tiny go-getter is so much more than a riser of bread - it’s used in beer, wine, and chocolate making, can be sprinkled on food to add protein, or as an umami-rice parmesan replacement, among other uses. But hey - we’re here for the baking, so let’s dive into that! The whole biochemical fermentation process practiced today to make yeast was unknown some 5,000 years ago. However, that didn’t stop Egyptians from making yeast and alcoholic beverages. Apparently, they used natural microbial flour contamination along with fruit sugar and milled grains to produce yeast and wine. For hundreds of years, yeast was produced as a byproduct of wine and brewing. Back then, bakers had no clue that yeast was a living microorganism. What does Yeast Do exactly? Easy! Yeast devours starch and sugar to produce alcohol and carbon dioxide. Since CO2 is trapped within the gluten-structure of the dough, it causes the dough to expand. When bread (including all the sweet members of the bread family - I’m looking at you cinnabuns!) dough is kneaded, all those gas bubbles are trapped and distributed in the dough. This gas is what makes the bread rise. Most of the bread recipes made at home require an hour or two to rise. For more flavourful results, you can slow down the process by putting your dough in a cool place like a refrigerator and allowing it to very gradually ferment and expand (overnight is great!). Cream Yeast: Don’t worry about it. A liquid form of yeast that is only used in industrial bakeries in huge quantities. It’s not available for home use. Wild Yeast/ Sourdough Starter: A mixture of flour, water, and the wild yeasts and bacteria trapped from the air. A gooey, sticky paste, starters are a commitment, and need to be kept alive with new food and water on a consistent schedule. Creating your own starter to use for sourdough baking is really easy, plus there is serious satisfaction when you create your own starter and keep it alive to use. A good sourdough starter can last for years, even decades, with the proper loving care! Compressed/Cake Yeast: This is a soft solid yeast with almost all the liquid removed. It’s not super easy to find these days, but if you do, use it all or keep it in the freezer, as it’ll go bad within 2 weeks. Instant Yeast: Quite similar to active dry yeast but with a few changes. It has smaller granules and more live yeast cells. It’s more perishable than active dry yeast but the good thing is that it doesn’t need to be rehydrated and can be added to every kind of dough except for very dry doughs. Rapid Rise Yeast: A form of instant yeast but with better output, i.e, faster rising than instant yeast because of excess amount of carbon dioxide production. Some experts, however, think that this yeast doesn’t produce as a good a flavour as other kinds. Dead Yeast: The yeast used may be dead. To check it, add warm water and sugar and cross your fingers for a bubbly foamy reaction in about 5 minutes. If this doesn’t happen, then the yeast’s dead and you need to get your hands on a new packet. Used too Cold/Hot Water: Very hot water kills the yeast (37C/100°F for cake yeast, 49C/120°F for active dry, and 54C/130°F for instant). Similarly, adding water which is below 21C/70°F won’t activate the yeast. Salt Added Too Early: Yeast won’t multiply when salt is added too early as it restricts the yeast from multiplying and the bread doesn’t rise. The type of yeast: The amount of yeast needed largely depends on the type of yeast used. For example, more cake yeast is needed to raise the same amount of dough than instant or active dry yeast. The temperature of the dough: Yeast work better in higher temperatures, so, you need less yeast in a warm environment. Moreover, you don’t really need more yeast if you want to go for a long rise. The only time you need more yeast is when you need a quick rise in a cold environment. The length of time: The quicker the rise, the more yeast you need. Rising times can be controlled by changing the amount of yeast and temperature. For example, if a recipe requires 2 tablespoons of yeast and 3 hours of rising, but you’re going to be out for the day, you can reduce the yeast to a single tablespoon and let it rest in the refrigerator for a few more hours. About 25% of the genes found in yeast can also be found in the human genome. We’re a quarter yeast people! Ah, sugar. Ask some people these days, and they’ll tell you it’s poison, and we’ll look back on our sugar consumption the way we look back at pregnant women in the 50s smoking! But ask a pastry chef, and they’ll roll their eyes and ask how exactly you plan to spin delicate threads of your organic agave nectar over a croquembouche! Health questions aside - I think sugar is fascinating. Its origins and cultivation, its dizzying variations, and what it does in baked goods (clue: it’s not just for sweetness!) Let’s dive in shall we? 2. The beginning of manufacturing of cane sugar granules from the sugarcane juice in India a little over two thousand years ago, followed by improvements in refining the crystal granules in India in the early centuries A.D.
4. The spread of cultivation and manufacture of cane sugar to the West Indies and tropical parts of the Americas beginning in the 16th century, followed by more intensive improvements in production in the 17th through 19th centuries in that part of the world. 5. The development of beet sugar, high fructose corn syrup and other sweeteners (cue shudder from health nuts) in the 19th and 20th centuries. Think about that incredible journey next time you stir a spoonful into your coffee! Sucrose, fructose, glucose - what’s the difference?? Sugar, or sucrose, is a carbohydrate naturally present in fruits, vegetables and even nuts (it’s a mix of carbon, hydrogen, and oxygen, for you molecular-level nerds!) Sugar is actually a product of photosynthesis, the process by which plants convert carbon dioxide, water and energy from the sun into food. What we call sugar, or sucrose, is actually two simpler compounds stuck together - a glucose ring and a fructose ring. Of all plants, sugar is most concentrated in sugar beets and sugarcane, about 16% and 14%, respectively. The high sugar concentration of these plants makes them ideal for farmers to grow and harvest sucrose. Once separated from the beet or cane, the result is pure sucrose, which is identical to sucrose found in fruits and vegetables and contains no preservatives or additives of any kind. To go from sugarcane to refined table sugar, the stalks are cut up and then crushed with rollers until juice is squeezed out. Milk of lime and carbon dioxide are added to help make the juice clear, then it's sent through an evaporator to remove the water and concentrate it into a syrup. The sugar in the syrup is crystallized, and you end up with a pile of raw sugar crystals covered in molasses. Feel like your cake batter isn't sweet enough? Well, you can throw in an extra spoonful of sugar, right? Nuh-uh - Too much sugar makes baked goods turn brown rapidly, so you risk ending up with a dark colour on the top and a raw cake on the inside. Conversely, reducing the sugar isn’t such a great idea either (in many, but not all, recipes). Too little sugar makes baked goods crumbly, so they won’t hold together. Baked goods won’t properly brown either, and aside from that, the flavour just isn’t as good now, is it?! The general rule is that you can often swap out sugar for a friendly substitute. Pair like with like. For instance, swapping dark brown sugar if the recipe intended light brown sugar won't mess up the baking, but it may slightly alter the final flavour. Using honey instead of maple syrup or corn syrup will work, with the only major change being the flavour alteration. But you can't stray too far: swapping molasses for granulated sugar in a recipe, for instance, will seriously alter the finished product. Recipes that call for some kind of sugar in granules, or crystals, do so for a reason; the crust and crunch depend on it! A note on sweeteners: If using a sugar substitute for baking, make sure it is labelled as being appropriate for baking. Many sugar substitutes aren’t appropriate for baking. Many are far sweeter than natural sugar, and the flavour just doesn't work. Second, the chemical makeup of these sugar substitutes is different, so the chemical reactions during the baking process won't necessarily be the same. Structure, browning, and cook times, not to mention sweetness, can all be affected. Granulated sugar. A highly refined, multi-purpose sugar. It's also sometimes called refined, table, or white sugar. Granulated sugar is made from sugarcane and sugar beets. It's also the most common type of sugar used in baking and cooking. Caster sugar is superfine granulated white sugar. Because the crystals are so fine, they dissolve much quicker than standard granulated white sugar, which makes it ideal for making meringues, syrups, and cocktails. Confectioners/Icing sugar, Also referred to as powdered sugar and 10x sugar, this is a type of white sugar that has been ground into a fine powder. To prevent clumping, a small amount of corn-starch is typically blended in. Confectioners’ sugar easily dissolves in liquid, and is ideal for making icing and frosting, as well as decorating baked goods. Pearl Sugar: Sometimes called nib sugar or hail sugar, pearl sugar is a variety of white sugar that has a coarse, hard texture and an opaque colour. It also holds its shape, and doesn't melt when exposed to high temperatures. Pearl sugar is commonly used in Scandinavian baking to decorate pastries, cookies, and buns, or on French choquettes. Sanding sugar is used mainly for decorating. It has large crystals, which are fairly resistant to heat and add extra texture and crunch to cookies and other baked goods. You can find sanding sugar in a rainbow of colours. 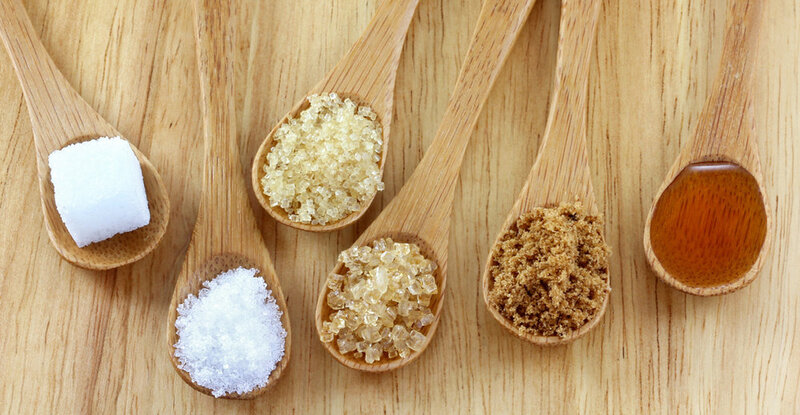 Cane Sugar: Unlike granulated sugar, which comes from sugarcane or sugar beets, cane sugar is produced solely from sugarcane and is minimally processed. It also has a slightly larger grain, darker colour, and higher price tag. Use cane sugar the same way you would granulated sugar. Demerara sugar is a variety of raw cane sugar that is minimally refined. It has large grains with an amber colour and a natural, subtle molasses flavour. Use it to sweeten coffee or tea, or as a topping on baked goods, like muffins, scones, cookies, and cakes. Turbinado is another type of minimally refined raw cane sugar. This sugar variety has large, medium-brown crystals, and is often mistaken for standard brown sugar because of its colour, although it's not the same thing. Turbinado sugar has a delicate caramel flavour and is commonly used to sweeten beverages and can also be used in baking. Also referred to as Barbados sugar. Muscovado sugar is a variety of unrefined cane sugar in which the molasses isn't removed. It comes in dark and light varieties, and has a sticky, wet, sandy texture with a rich, complex flavour. While muscovado sugar can be used as a substitute for brown sugar, its flavour is much stronger. It's especially wonderful in barbecue sauce, marinades, and savoury dishes. Light brown sugar is refined white sugar with a small amount of molasses added in. It has a wet, sandy texture — although less sticky than muscovado sugar — and a delicate caramel flavor. Use it for making any baked goods, as well as in savory dishes. Like its lighter counterpart, dark brown sugar is refined white sugar with molasses added in. It contains more molasses than light brown sugar, which gives it a stronger, more intense flavor. Light and dark brown sugar can be used interchangeably. A spoonful of sugar in a vase of freshly-cut flowers will keep them perky for longer! I wanted to start the 'Baking Basics' series with eggs because they’re kindof a miracle food. Forget your goji berries and your kale people, eggs are where it’s at! Combine eggs with flour and sugar, and you’ve got three of the heavyweights of the dessert world. As in, if you're stuck on a desert (dessert?!) island and you care more about pancakes than hunting for wild game or fashioning a shelter, you'll need these power players. We don't have proof that goes back far enough, but it's likely that bird eggs have been roasted ever since man discovered fire (and were probably eaten raw before that), and we know from the recipes of ancient Rome and Egypt that sweet custards were mixed up thousands of years ago. By the medieval era, the French were whipping up creme anglaise and egg white foams, and by the time Monsieur Escoffier came along over a hundred years ago (with no fewer than 143 egg recipes in his Guide Culinaire), the road was well-paved for the sauces, foams, meringues, souffles and pastry creams we make today. I sometimes marvel at how much trial and error must have gone into some of these creations. Seriously - I marvel! Because it is designed to contain everything needed to create and sustain new life, the egg is an ideal human food. It contains a balanced portion of nutrients, all safely contained in a waterproof package, that lasts for weeks with little to no care. Genius! Eggs are made up of the fatty yolk (vitellus) and near fat-free white (albumen). But before you whip up that egg-white only omlette, know that the yolk - which is approximately 30% of the weight of the egg - provides the protein and most of the nutrients, while the white is mainly protein and water. Unfortunately, these days mass production generally makes for unhealthy, unhappy hens, and lesser-quality eggs, so I tell my students to pay a little extra and go for free-range, organic eggs whenever possible. Luckily, here in Montreal, the farmers markets often carry a gorgeous variety of chicken, duck (higher in almost every major mineral than chicken eggs), quail and goose eggs, I definitely recommend experimenting with these - sponge cake with goose eggs is fantastic! Eggs never cease to amaze me. They’re made up, mainly, of protein, fat and water, but the different ways these three components align make for a dizzying array of textures and flavours. Thanks to the protein, eggs are major structure-builders. They provide support for flour-based desserts, they emulsify (bring water and fat together) batters, and form the creamy base of custards, sauces, and ice cream. The yellow pigments that make the yolk come directly from the plants eaten by the hen, which in turn have captured and transformed the energy of the sun. Think about that next time you order “sunny side up”! Back in Ireland, we never refrigerate our eggs, and North American visitors are often horrified to see them in the regular, unrefrigerated isle of the supermarket with the baking products. Could it be that our tradition of having big families (there are seven in mine!) means that eggs don’t hang around for long at home, so, is it ok to leave them out?! Or maybe the poor insulation in many old houses means that the pantry is a few degrees lower than North American “room temperature”. Nope, actually it's more boring than that. In lots of European countries, egg-laying hens are obliged by law to be vaccinated against salmonella, one of the more dangerous bacteria that can cause food poisoning. In north America, it's not obligatory, so keeping them in the fridge is safer, because it prevents any salmonella on the shells from multiplying. In any case, it’s been shown that an egg ages one week for every day that it’s at room temperature - but kept in the refrigerator, eggs will last up to five weeks without too much change to the quality. Cool finishing fact: Do you know what the difference is between brown and white eggs? a) They're bleached to make consumers happy? b) The feed of the hens is different? c) The heath of the hen affects the colour? Nope! None of the above! It’s just different species of hen (like a labrador and a pug!) White chickens in general lay white eggs, and brown chickens lay brown ones. Both equally great in a sponge cake! So, What do they do in desserts? 1. Structure – eggs become firm when heated. Eggs that are mixed in your batter, dough or custard will set and provide structure. 2. Leavening- whipped or aerated eggs can act as a leavening agent in cakes and create a light texture. Egg whites particularly, trap air bubbles and will then hold the air and help achieve a light fluffy texture and a good rise. The process of whipping whole eggs or egg whites is sometimes used instead of a raising agent in cakes. The protein and absence of fat is what gives the egg whites the famous ability to foam. 3. Flavour: the fat content in egg yolks enriches the flavour of baked goods. 4. Appearance – eggs can be used to glaze or coat the outside of pastries, crusts, biscuits etc to give a shine when baked. 5. Binder – eggs emulsify fats and liquids and so are used as a binding agent to hold everything together. In general, using more whites gives a fluffy and light texture, while using more yolks will create a dense and rich flavour. When both white and yolk are used together, they create a rich flavour and light texture. For binding – use the new miraclefood, Aquafaba (it's the liquid from canned beans!) or mix flaxseed or chia seed and water to form a gel, or try arrowroot or potato flour. For leavening – add extra baking soda – although beware: this can cause bitterness and extra browning. Egg shells are edible and a good source of calcium and glucosamine, which is good for joints. You can grind them and add to smoothies or your oatmeal! Now that you're armed with all this new knowledge - go make something with eggs and be amazed at the power of this humble ovoid! A blog - but why?! As you might have guessed, I LOVE dessert. I love eating anything with sugar, and I adore mixing, folding, melting, whipping, kneading, shaping, slicing and baking sweet treats. But there's one thing I love just a teeeny bit more, and that's teaching. What I really, really love is making people's eye go wide and their eyebrows raise when I explain what happens to cakes in the oven, or to egg whites when you whip the air in, or to chocolate when you melt it not-quite-all-the-way. I love inspiring people to think about the food that's in front of them, about the ingredients, and the techniques, and even about the science. Why do people get scared when they hear that phrase "Baking is a science"?! Eating and digesting an apple is also a science but that doesn't put us off. Come to think of it, so's breathing, and we don't generally shy away from that! You don't actually need to know much at all about the science of baking in order to do it, but.....a little extra knowledge can make it so much more satisfying, and will give you the confidence to break outside the recipe box and start experimenting, which is so much fun!! Anyway, this blog will hopefully demystify some of baking's most common heros (sugar! flour!) and make you excited to get into the kitchen and create something mouthwatering.